You can no longer afford to use a “one-size fits all” approach to leadership. The workforce is changing and your leadership style needs to change along with it. How can one leadership style possibly work? It can’t and it won’t. Adaptive Leadership is the answer. You will find the performance and attitude of your team improve dramatically when you know how to adapt your approach, based on their skills, experience and the situation. The three primary leadership styles including when and how to use them to achieve your goals. The eBook also contains simple, practical exercises to help you learn how to get the best results from your team, by adapting your style to suit the situation. You need to change your leadership style in order to be a good leader. Many leaders refuse to adapt their approach, believing that it’s their teams fault that things aren’t working. These leaders are not enjoyable to work for and usually have unhappy teams. Worse, they develop a bad reputation. You need to avoid the traps of bad leaders by being able to change your leadership style. Enter adaptive leadership. 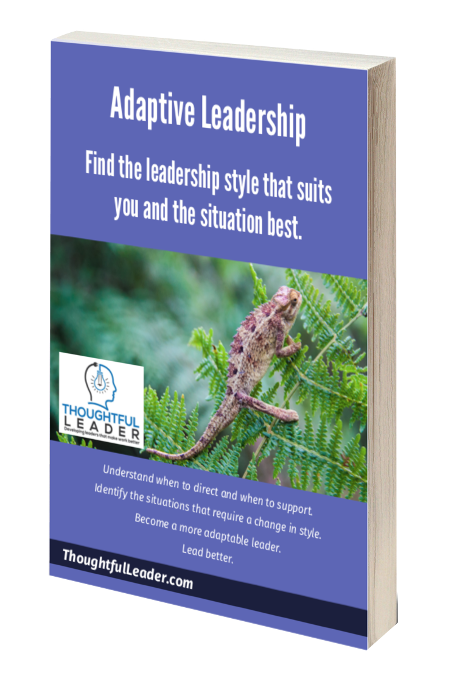 The Adaptive Leadership Guide contains useful, practical information in an easy to use format. It also contains simple, practical exercises to better understand your leadership style and how to apply it to your team. The three main leadership styles including when and how to use them to achieve your goals.